Before you have your heart racing – NO, this is not an Android One phone. Specifications are similar to what you find on an Android One phone and so is the price (well, almost) but without Google blessings things will be different. Xolo was among 9 new Android One partners announced by Google and will eventually release an Android One handset, but this one doesn’t have the customary Android One insignia. The navigation keys are also capacitive ones and not on-screen buttons as preferred by Google. You get a 4.5 Inch IPS LCD display with FWVGA resolution powered by MediaTek MT6582 1.3 GHz quad core SoC, 1 GB RAM and 8 GB ROM (not 4 GB as in other Android One phones), which can be further expanded by 32 GB using MicroSD card. There is a 5 MP rear camera with LED flash and a VGA front camera for video calling. The Xolo One is 9.3 m thick and houses a 1700 mAh battery. As you can see in the images, Xolo One will be available in several color options with faux leather rear finish. Software is Android 4.4.2 KitKat and to bridge the software gap between Android One phones and Xolo One, Xolo has promised Android 5.0 Lollipop upgrade on this handset! So basically, Xolo One offers more internal storage (8GB VS 4GB) and effectively larger display as there are no on software buttons to consume screen space. So yes Xolo One attempts to make Android One better while promising latest Android software upgrade, the biggest plus point for Android One sets. However, updates beyond Android 5.0 are not promised (they are promised on Android One). And then there is the question of who you trust more to handle your software update – Xolo or Google itself? Xolo One is definitely an amusing attempt. 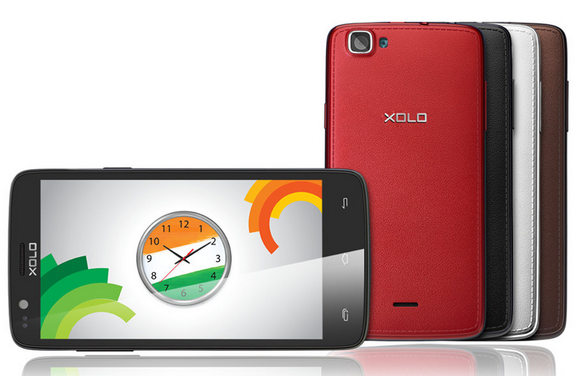 What would you choose – Xolo One or an Android One Phone?